The condominium is located in lovely grounds overlooking this spectacular lake. It is a few minutes walk from the lakeside, a few more from the charming town. It has the use of a wonderful swimming-pool (photo available on request), with a toddler pool and restaurant and a magnificent view. It is surrounded by lovely grounds rich in mature trees, and offers safe access to the lakeside via an underpass under the road. Where we join the lake is the best beach on the lake (stony), and the swimming is wonderful. Public transport and road links are very good and trips can easily be made to Gardaland,Verona,Venice,Milan,Mantova etc. Ferry services take you to many other little towns around the lake, and there are all types of walks, from strolling along the promenade, to climbing in the nearby mountains (helped by a cable car). The town, with its pedestrianised shopping area of old and narrow lanes, has cafe's, bars and restaurants to suit every budget. Other apartments can be taken along with apt 510 for larger groups. General information: We feel very lucky to have discovered these apartments, and to own one. The view from the balconies, the grounds, the walks of all kinds, the mountain scenery, the changing appearance of the lake, the shoreline, the cafe's and restaurants on the promenade, the proximity of wonderful historic cities - it is all so beautiful! There are various facilities and theme parks to entertain the children and the climate is excellent. The condominium can easily be reached by bus from Verona airport, while there are cheap flights to Verona, Bergamo, Venice and Milan (in order of closeness). Hire a car or use train and bus or we can arrange for our friendly taxi-driver to meet you. Or drive down. Finally, if, like me, you worry about the effect of flying on our environment, there is a very pleasant train route, at least from the south of England. Take the Eurostar to Paris Nord, cross to Gare de Bercy, and take the night train to Verona arriving 7.25am. For other train routes, please contact us. Before you leave this page:: We haven't mentioned the open-air opera in the Arena in Verona. It's on in July and August, it's easy to get tickets, and there are buses to take you there from outside our gate. Nor have we mentioned Signora Maria Luisa, our English-speaking colleague and housekeeper of the condominium. She looks after our guests beautifully and sorts out any problems. She leaves a basic welcome pack for new arrivals, and basic cooking necessities are also left. Warning: There is a longish slope and 35 steps up to the pool, but you can also reach it by car. 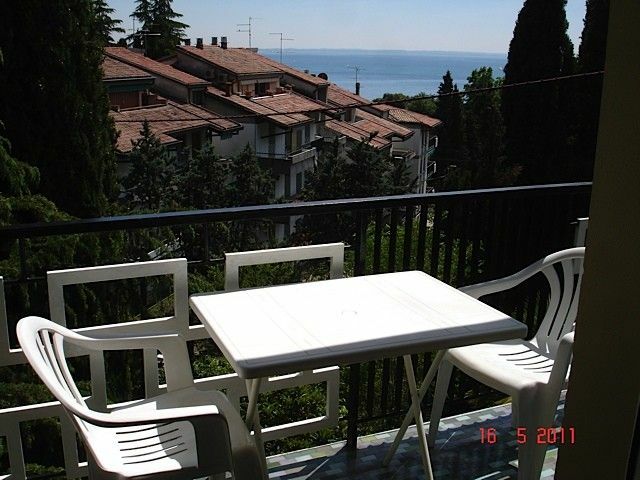 See also property number 4054 for a one-bedroom apartment for a couple in Bardolino, a little further south on Lake Garda. Strictly speaking, air-cooling plus fans. Yes, and the beds made up - though a dicount of 10 euros a head if offered if you choose to take your own bedlinen and indoor towels. Plenty of spaces in grounds and overflow area. Indoor towels provided, unless you are claiming the discount! Bring your own swimming towels. On the landing and in the hall. Normal, plus adjoining pull-down single beds - see photo. Accessible from both rooms without one disturbing the other. Two balconies, one sunny, one shaded. IMPORTANT: The air-conditioning is an old-fashioned air-cooling system. It does not extend well into the bedroom, where there is a ceiling-fan which we have always found quite adequate. As well as the double bedroom there are two adjoining single beds in the living-room. The balconies face south, one being sunny, one being shaded. Of the above facilities, the swimming-pool, washing-machine, garden, swings, cots and high-chairs are communal. There is a ramp and lift for wheel-chair access, and I am assured the doors are wide enough for a wheel-chair. As well as the wonderful swimming-pool we share with another complex, there is a spectacular new Leisure Centre with pools in Garda which you can reach using the free town shuttle bus. Sehr schöne Ferienwohnung in einer Parkanlage (mit dem Charme der 60er-Jahre, damals absoluter Luxus). Sehr gutes Preis-Leistungsverhältniss (Nebensaison Mitte September). Wir waren 5 Tage in 510, dann 9 Tage in 715. App. 510: Mit separatem Schlafzimmer und guten Betten (besser als 715). Küche und Einrichtung ist besser ausgestattet als 715 (man merkt, dass die Besitzer selbst hier manchmal wohnen. 2 Balkone, ein Sonnen- und ein Schatten-Balkon. App. 715: Balkon mit Seeblick, 3.Stock (mit Aufzug). Sonnenschirm mitbringen (sonst ist es zum Frühstück zu warm)! Gut ausgestattete Küche mit Toaster, Käsereibe (Parmesan), Espressokanne, Pfannen (eine war dreckig von den Vor-Feriengästen), 2-Plattenherd. Nicht perfekt (das hatten wir auch nicht erwartet): 2 (Schrank-)Betten sind etwas umständlich zu handhaben, die Schlafcouch ist nicht sehr rückenfreundlich (eher etwas für Kinder). Manches ist etwas ältlich: Das (alte) Schloss ließ sich nach 3 Tagen nicht mehr abschließen; Ali, der nette Hausmeister hat es recht schnell geschmiert. Das hielt dann 5 Tage... dann hat er es wieder geschmiert (soll ersetzt werden). Die Dusche hielt nur recht locker in der Halterung und rutschte manchmal raus (Der Duschkopf ist ersetzt worden-ein anderes Modell). Etwas Englisch und/oder Italienisch sollte man sprechen. Ali und Maria-Luisa (die netten Ansprechpartner vor Ort) können kein Deutsch. Tessa aus England, die Besitzerin und Managerin von 510 und 715 ist supernett. Wenn sie da ist, kümmert sie sich, sofort, wenn es Probleme gibt. Wonderful Stay. Nice apartment, fantastic pool. Friendly, picturesque an ideal location. We loved our stay here. The description of the area doesn't tell the full story. The apartment is perfectly placed for walking to the town along the bay, going swimming in the lake and generally exploring the area. It was a good size for the four of us, especially having two en suite bathrooms. The swimming pool is a real gem. This is the first one I've seen with an island in the middle growing olive bushes. It's beautiful at the pool and we spent many a lazy morning having excellent coffee and later lunch from the restaurant. Great food. The condo is on the edge of the historic little town of Garda,which is on the south-east shore of the lake at its widest part, in a sheltered bay. The location is fantastic, with 3-minute access to the lakeside via our private underpass, where you find a promenade into town on your left (7 mins), a cafe/bar 150 metres along to the right, and the beach in the photo stretching round the bay to your right. There are walks along the lakeside in both directions, and also up into the hills around. We always feel sorry for the visitors we see trailing down the roads to the lake from the hotels a bit further inland. Garda offers easy access to Verona, Venice , Mantua, Milan and - further away - Bologna. Easy-jet and BA fly from Gatwick to Verona.